We were blessed last summer to have a volunteer come help us get organized. During her time here, she fell in love with what God is doing through this amazing ministry. Her experience led her to believe that her clients would benefit from volunteering here at our Community Center to learn work skills to obtain jobs in the future. Once we met these lovely clients of hers, we fell in love with their amazing and genuine spirits! As the weeks turned into months, we learned our new volunteers’ gifts and talents that are uniquely theirs so we could assign tasks and responsibilities that would not only train them for the workplace, but make their experiences here enjoyable. It has been a wonderful journey working with our dependable volunteers. 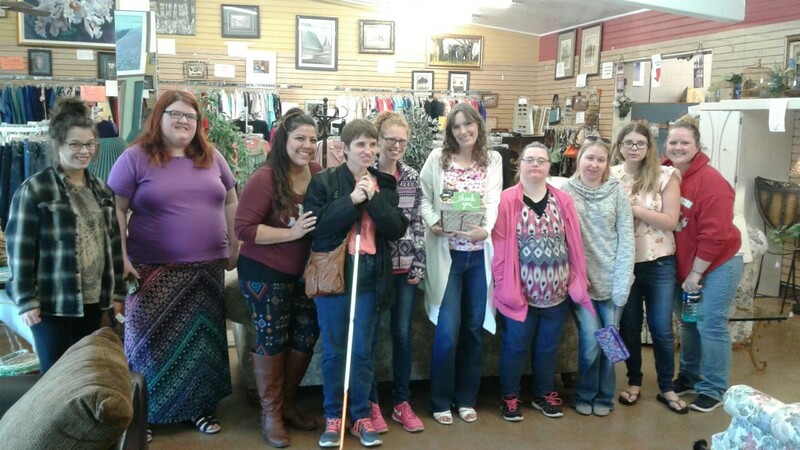 They are learning customer service, retail musts like pricing and proper displays, sorting and cleaning, the responsibilities of daily routines, successfully completing tasks, and especially the rewarding feeling of making a difference in the community with everything they put their hands to. They thank us for this opportunity and tell us how much they appreciate us, but the truth is they bring a light and youthful delight into this Community Center every time they volunteer. They help us so much whether they are putting out the free baby clothes, making jewelry, or cutting pretty price tags. Thank you our precious Work Skills Staff! 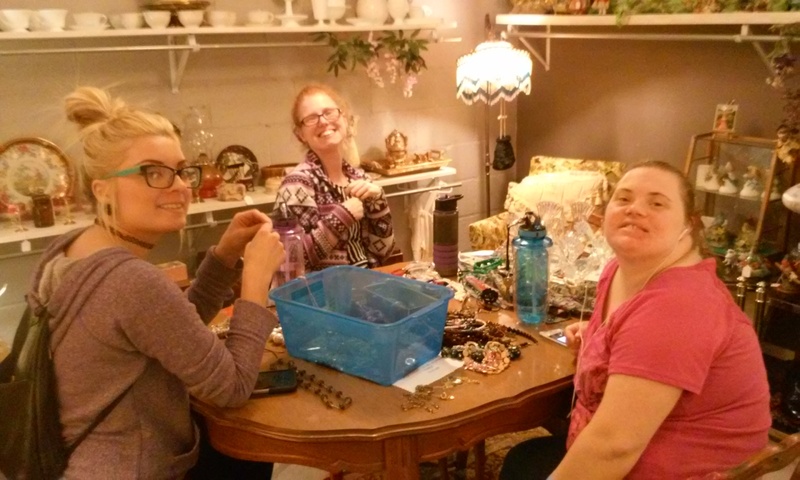 Here, our Work Skills Staff is sorting and pricing jewelry. They were happy they got to work in the Vintage Room. This display of free baby clothes has been carefully and lovingly sorted and prepared by our Work Skills Staff! 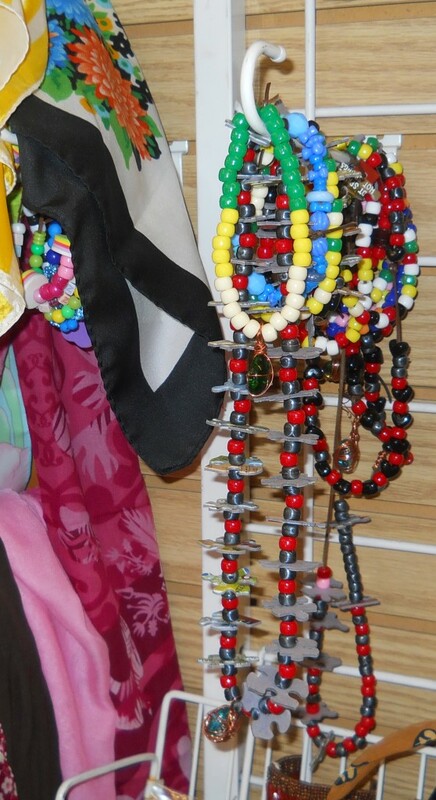 Here is some of the beautiful jewelry our Work Skills Staff made. People love them and the children are drawn to their bright colors! The whole group surprised us with a thank you gift and card. We feel so honored and blessed to be a part of these amazing lives!